As many researchers have pointed out, this historical narrative delineating the Crown Temple is just one piece of the puzzle. It is, after all, only one level removed from the ongoing ‘ownership’ conspiracy centered in Washington, D.C. commonly known as the U.S. Government, Inc. Nevertheless, the following account represents a critical back story — important history, if you will, which must be correctly understood if the American people are to take back their country. How many levels back must one go to properly unravel this story regarding world ownership? In certain circles it is quite well known that the Black Nobility had amassed an unprecedented accumulation of wealth, and one that began several centuries before the Rothschild banking clan ever opened their first bank account. Click on diagram to enlarge. The governmental and judicial systems within the United States of America, at both federal and local state levels, is owned by the “Crown,” which is a private foreign power. Before jumping to conclusions about the Queen of England or the Royal Families of Britain owning the U.S.A., this is a different “Crown” and is fully exposed and explained below. We are specifically referencing the established Templar Church, known for centuries by the world as the “Crown.” From this point on, we will also refer to the Crown as the Crown Temple or Crown Templar, all three being synonymous. The U.S.A. is not the free and sovereign nation that our federal government tells us it is. If this were true, we would not be dictated to by the Crown Temple through its bankers and attornies. The U.S.A. is controlled and manipulated by this private foreign power and our unlawful Federal U.S. Government is their pawnbroker. The bankers and Bar Attorneys in the U.S.A. are a franchise in oath and allegiance to the Crown at Chancery – the Crown Temple Church and its Chancel located at Chancery Lane – a manipulative body of elite bankers and attorners from the independent City of London who violate the law in America by imposing fraudulent “legal” – but totally unlawful – contracts on the American people. The banks Rule the Temple Church and the Attorners carry out their Orders by controlling their victim’s judiciary. The legal system (judiciary) of the U.S.A. is controlled by the Crown Temple from the independent and sovereign City of London. The private Federal Reserve System, which issues fiat U.S. Federal Reserve Notes, is financially owned and controlled by the Crown from Switzerland, the home and legal origin for the charters of the United Nations, the International Monetary Fund, the World Trade Organization, and most importantly, the Bank of International Settlements. Even Hitler respected his Crown bankers by not bombing Switzerland. The Bank of International Settlements in Basel, Switzerland controls all the central banks of the G7 nations. He who controls the gold rules the world. ATTORN [e-‘tern] Anglo-French aturner to transfer (allegiance of a tenant to another lord), from Old French atorner to turn (to), arrange, from a- to + torner to turn: to agree to be the tenant of a new landlord or owner of the same property. Merriam-Webster’s Dictionary of Law ©1996. REGULATION n. 1 [C] a rule, statement about what can be done and what cannot. 2 [U] the general condition of controlling any part of human life. -Newbury House Dictionary ©1999. CODE n. 1 [C;U] a way of hiding the true meaning of communications from all except those people who have the keys to understand it. 2 [C] a written set of rules of behavior. 3 [C] a formal group of principles or laws. -v. coded, coding, codes to put into code, (syn.) to encode.ENCODE v. 1 to change written material into secret symbols. -Newbury House Dictionary ©1999. CURTAIN n. [OE. cortin, curtin, fr. OF. cortine, curtine, F. courtine, LL. cortina, also, small court, small inclosure surrounded by walls, from cortis court. See Court.] 4 A flag; an ensign; — in contempt. [Obs.] Shak. Behind the curtain, in concealment; in secret. -1913 Webster’s Revised Unabridged Dictionary. TEMPLE, n. [L. templum.] 1. A public edifice erected in honor of some deity. Among pagans, a building erected to some pretended deity, and in which the people assembled to worship. Originally, temples were open places, as the Stonehenge in England. 4. In England, the Temples are two inns of court, thus called because anciently the dwellings of the knights Templars. They are called the Inner and the Middle Temple. -Webster’s 1828 Dictionary. INN, n. [Hebrew, To dwell or to pitch a tent.] 2. In England, a college of municipal or common law professors and students; formerly, the town-house of a nobleman, bishop or other distinguished personage, in which he resided when he attended the court. Inns of court, colleges in which students of law reside and are instructed. The principal are the Inner Temple, the Middle Temple, Lincoln’s Inn, and Gray’s Inn. Inns of chancery, colleges in which young students formerly began their law studies. These are now occupied chiefly by attorneys, solicitors, etc. CROWN, n. 4. Imperial or regal power or dominion; sovereignty. There is a power behind the crown greater than the crown itself. Junius. 19. A coin stamped with the image of a crown; hence, a denomination of money; as, the English crown. — Crown land, land belonging to the crown, that is, to the sovereign. — Crown law, the law which governs criminal prosecutions. — Crown lawyer, one employed by the crown, as in criminal cases. v.t. 1. To cover, decorate, or invest with a crown; hence, to invest with royal dignity and power. -1913 Webster’s Revised Unabridged Dictionary. PATENT, a. [L. patens, from pateo, to open.] 3. Appropriated by letters patent. 4. Apparent; conspicuous. PATENT, n. A writing given by the proper authority and duly authenticated, granting a privilege to some person or persons. By patent, or letters patent, that is, open letters, the king of Great Britain grants lands, honors and franchises. LAWFUL. In accordance with the law of the land; according to the law; permitted, sanctioned, or justified by law. “Lawful” properly implies a thing conformable to or enjoined by law; “Legal”, a thing in the form or after the manner of law or binding by law. A writ or warrant issuing from any court, under color of law, is a “legal” process however defective. – A Dictionary of Law 1893. STATUS IN QUO, STATUS QUO. [L., state in which.] The state in which anything is already. The phrase is also used retrospectively, as when, on a treaty of place, matters return to the status quo ante bellum, or are left in statu quo ante bellum, i.e., the state (or, in the state) before the war. Globally, all the legalistic scams promoted by the exclusive monopoly of the Temple Bar and their Bar Association franchises come from four Inns or Temples of Court: the Inner Temple, the Middle Temple,Lincoln’s Inn, and Gray’s Inn. These Inns/Temples are exclusive and private country clubs; secret societies of world power in commerce. They are well established, some having been founded in the early 1200’s. The Queen and Queen Mother of England are current members of both the Inner Temple and Middle Temple. Gray’s Inn specializes in Taxation legalities by Rule and Code for the Crown. Lincoln’s Inn received its name from the Third Earl of Lincoln (circa 1300). While the Inner Temple holds the legal system franchise by license to steal from Canada and Great Britain, it is the Middle Temple that has legal license to steal from America. This comes about directly via their Bar Association franchises to the Honourable Society of the Middle Temple through the Crown Temple. It’s a real eye opener to know that the Middle Inn of the Crown Temple has publicly acknowledged there were at least five Templar Bar Attornies, under solemn oath only to the Crown, who signed what was alleged to be an American Declaration of Independence. This simply means that both parties to the Declaration agreement were of the same origin, the Crown Temple. In case you don’t understand the importance of this, there is no international agreement or treaty that will ever be honored, or will ever have lawful effect, when the same party signs as both the first and second parties. It’s merely a worthless piece of paper with no lawful authority when both sides to any agreement are actually the same. In reality, the American Declaration of Independence was nothing more than an internal memo of the Crown Temple made among its private members. One should particularly notice that a lawful state is made up of the people, but a State is a legal entity of the Crown – a Crown Colony. This is an example of the deceptive ways the Crown Temple – Middle Templars – have taken control of America since the beginning of our settlements. Americans were fooled into believing that the legal Crown Colonies comprising New England were independent nation states, but they never were nor are today. They were and still are Colonies of the Crown Temple, through letters patent and charters, who have no legal authority to be independent from the Rule and Order of the Crown Temple. A legal State is a Crown Temple Colony. Neither the American people nor the Queen of Britain own America. The Crown Temple owns America through the deception of those who have sworn their allegiance by oath to the Middle Templar Bar. The Crown Bankers and their Middle Templar Attornies Rule America through unlawful contracts, unlawful taxes, and contract documents of false equity through debt deceit, all strictly enforced by their completely unlawful, but “legal”, Orders, Rules and Codes of the Crown Temple Courts, our so-called “judiciary” in America. This is because the Crown Temple holds the land titles and estate deeds to all of North America. “Our countries are embarked on a new relationship for the 21st century, founded on a commitment to the values of democracy, the free market, and the rule of law.” – Joint Statement by President George W. Bush and President Vladimir V. Putin on 11/13/01, spoken from the White House, Washington D.C. The people who comprise the citizenry of a state are recognized only within natural and common law as is already established by God’s Law. Only a State Citizen can be a party to an action within a State Court. A common state citizen cannot be recognized in that court because he doesn’t legally exist in Crown Chancery Courts. In order to be recognized in their State Courts, the common man must be converted to that of a corporate or legal entity (a legal fiction). The Crown Temple was granted Letters Patent (see definition above) and Charters (definition below) for all the land (Colonies) of New England by the King of England, a sworn member of the Middle Temple (as the Queen is now). Since the people were giving the patent/charter corporations and Colonial Governours such a hard time, especially concerning Crown taxation, a scheme was devised to allow the Americans to believe they were being granted “independence.” Remember, the Crown Templars represented both parties to the 1776 Declaration of Independence; and, as we are about to see, the latter 1787 U.S. Constitution. To have this “Declaration” recognized by international treaty law, and in order to establish the new legal Crown entity of the incorporated United States, Middle Templar King George III agreed to the Treaty of Paris on September 3, 1783, “between the Crown of Great Britain and the said United States”. The Crown of Great Britain legally was, then and now, the Crown Temple. This formally gave international recognition to the corporate “United States”, the new Crown Temple States (Colonies). Most important is to know who the actual signatories to the Treaty of Paris were. Take particular note to the abbreviation “Esqr.” following their names (see above definition for ESQUIRE) as this legally signifies “Officers of the King’s Courts”, which we now know were Templar Courts or Crown Courts. This is the same Crown Templar Title given to Alexander Hamilton (see above). The Crown was represented in signature by “David Hartley, Esqr.”, a Middle Templar of the King’s Court. Representing the United States (a Crown franchise) by signature was “John Adams, Esqr”, “Benjamin Franklin, Esqr.” and “John Jay, Esqr.” The signatories for the “United States” were also Middle Templars of the King’s Court through Bar Association membership. What is plainly written in history proves, once again, that the Crown Temple was representing both parties to the agreement. What a perfect and elaborate scam the people of North America had pulled on them! Since the Crown and its Templars represented both the United States, as the debtors, and the Crown, as the creditors, then they became the creditor of the American people by owning all debts of the former Colonies, now called the legal Crown States. This sounds too good to be true, but these are the facts. The words SCAM and HOODWINKED can’t begin to describe what had taken place. Since its beginnings, the Temple Church at the City of London has been a Knight Templar secret society. It was built and established by the same Temple Knights who were given their Rule and Order by the Roman Pope. It’s very important to know how the British Royal Crown was placed into the hands of the Knights Templars, and how the Crown Templars became the fiscal and military agents for the Pope of the Roman Church. We wish it to be known to all of you, through this our charter, furnished with our seal … not induced by force or compelled by fear, but of our own good and spontaneous will and by the common counsel of our barons, do offer and freely concede to God and His holy apostles Peter and Paul and to our mother the holy Roman church, and to our lord pope Innocent and to his Catholic successors, the whole kingdom of England and the whole kingdom Ireland, with all their rights and appurtenances … we perform and swear fealty for them to him our aforesaid lord pope Innocent, and his catholic successors and the Roman church … binding our successors and our heirs by our wife forever, in similar manner to perform fealty and show homage to him who shall be chief pontiff at that time, and to the Roman church without demur. As a sign … we will and establish perpetual obligation and concession … from the proper and especial revenues of our aforesaid kingdoms … the Roman church shall receive yearly a thousand marks sterling … saving to us and to our heirs our rights, liberties and regalia; all of which things, as they have been described above, we wish to have perpetually valid and firm; and we bind ourselves and our successors not to act counter to them. And if we or any one of our successors shall presume to attempt this, whoever he be, unless being duly warned he come to his kingdom, and this senses, be shall lose his right to the kingdom, and this charter of our obligation and concession shall always remain firm. Most who have commented on this charter only emphasize the payments due the Pope and the Roman Church. What should be emphasized is the fact that King John broke the terms of this charter by signing the Magna Carta on June 15, 1215. Remember; the penalty for breaking the 1213 agreement was the loss of the Crown (right to the kingdom) to the Pope and his Roman Church. It says so quite plainly. To formally and lawfully take the Crown from the royal monarchs of England by an act of declaration, on August 24, 1215, Pope Innocent III annulled the Magna Carta; later in the year, he placed an Interdict (prohibition) on the entire British empire. From that time until today, the English monarchy and the entire British Crown belonged to the Pope. FEALTY, n. [L. fidelis.] Fidelity to a lord; faithful adherence of a tenant or vassal to the superior of whom he holds his lands; loyalty. Under the feudal system of tenures, every vassal or tenant was bound to be true and faithful to his lord, and to defend him against all his enemies. This obligation was called his fidelity or fealty, and an oath of fealty was required to be taken by all tenants to their landlords. The tenant was called a liege man; the land, a liege fee; and the superior, liege lord. FEE, n. [In English, is loan. This word, fee, inland, or an estate in trust, originated among the descendants of the northern conquerors of Italy, but it originated in the south of Europe. See Feud.] Primarily, a loan of land, an estate in trust, granted by a prince or lord, to be held by the grantee on condition of personal service, or other condition; and if the grantee or tenant failed to perform the conditions, the land reverted to the lord or donor, called the landlord, or lend-lord, the lord of the loan. A fee then is any land or tenement held of a superior on certain conditions. It is synonymous with fief and feud. In the United States, an estate in fee or fee simple is what is called in English law an allodial estate, an estate held by a person in his own right, and descendible to the heirs in general. FEUD, n. [L. fides; Eng. loan.] A fief; a fee; a right to lands or hereditaments held in trust, or on the terms of performing certain conditions; the right which a vassal or tenant has to the lands or other immovable thing of his lord, to use the same and take the profits thereof hereditarily, rendering to his superior such duties and services as belong to military tenure, &c., the property of the soil always remaining in the lord or superior. ATTORNING, ppr. Acknowledging a new lord, or transferring homage and fealty to the purchaser of an estate. Bar Attorneys have been attorning ever since they were founded at the Temple Church, by acknowledging that the Crown and he who holds the Crown is the new lord of the land. CHARTER, n. 1. A written instrument, executed with usual forms, given as evidence of a grant, contract, or whatever is done between man and man. In its more usual sense, it is the instrument of a grant conferring powers, rights and privileges, either from a king or other sovereign power, or from a private person, as a charter of exemption, that no person shall be empanelled on a jury, a charter of pardon, &c. The charters under which most of the colonies in America were settled, were given by the king of England, and incorporated certain persons, with powers to hold the lands granted, to establish a government, and make laws for their own regulation. These were called charter-governments. By agreeing to the Magna Carta, King John had broken the agreement terms of his fealty with Rome and the Pope. The Pope and his Roman Church control the Crown Temple because his Knights established it under his Orders. He who controls the gold controls the world. The workings of the Crown Temple in this day and age is moreso obvious, yet somewhat hidden. The Crown Templars have many names and many symbols to signify their private and unholy Temple. Take a close look at the (alleged) one dollar $1 private Federal Reserve System (a Crown banking franchise) Debt Note. Notice in the base of the pyramid the Roman date MDCCLXXVI which is written in Roman numerals for the year 1776. 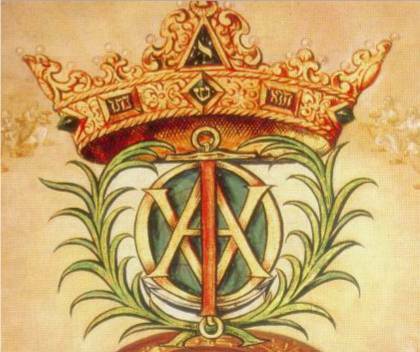 The words ANNUIT COEPTIS NOVUS ORDO SECLORUM are Roman Latin for ANNOUNCING THE BIRTH OF THE NEW ORDER OF THE WORLD. Go back to the definitions above and pay particular attention to the words CAPITOL, CROWN and TEMPLE. 1776 signifies the birth of the New World Order under the Crown Temple. That’s when their American Crown Colonies became the chartered government called the United States, thanks to the Declaration of Independence. Since that date, the United Nations (another legal Crown Temple by charter) rose up and refers to every nation as a State member.